If you are bored by your Job, then all more reason to learn digital marketing. Digital Marketing professionals are rear and thus in high demand. A simple course of 6 months can help you to win a successful job opportunity in one of the top MNC's. So, if it is a change that you want, Digital Marketing can give you that success. 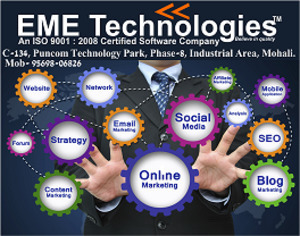 At EME Technologies, Our main focus is to provide 6 months training on Digital Marketing in Mohali | Chandigarh.